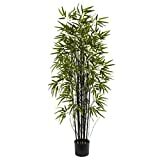 Black bamboo for sale is best planted in early spring which will result in the fastest growth. They are mostly sold in bare root form. Starting from a small size, most bamboo will reach mature height within five or six years. 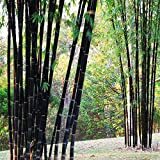 Under ideal conditions Black Bamboo will grow to 35 feet in height with culms over 2 inches in diameter, but 25 feet is its average height in most climates. 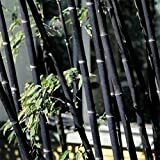 The stems of black bamboos grow in green and it may take 2 to 3 years for them to turn black. Location – Choose a spot that offers some protection from hot afternoon sun. They can be placed in an area with either full sun or part shade. However, the larger bamboos do best with 5 or more hours of direct sunlight. You can also grow black bamboos in containers as long as it is placed in a cool place in the winter to have a dormant period. The larger the space, the larger bamboo will grow. Soil – Black bamboo thrives in fertile, moderately acidic, loamy and well-draining soil. If planted in poor soil, it tends to grow in a tight cluster, producing mostly thin, weepy culms. It needs rich topsoil, composed of compost or aged manure and mulch. Planting – Space plants 3 to 5 feet apart to form a dense screen. The faster spreading types can be planted a little farther apart; others can be planted very close together as long as they have some space to spread in width. Dig a hole that is 2 to 3 times as wide and just as high as its root ball. Some varieties would need staking to prevent uprooting or breakage due to strong winds. Water – Water thoroughly when planting, and 2 – 3 times a week during dry weather, especially if it is in a container. Keep the soil moist but not soggy because black bamboo plants do not do well with soggy soil, but they need plenty of water. A well-established bamboo in a container should be watered 3 to 5 times per week during the summer, ensuring that the pot drains well. Lack of sufficient water especially during hot or windy weather is the leading cause of failure or poor growth of new black bamboo plants. Fertilizer – Black bamboos are heavy feeders. Give them a high nitrogen grass or lawn fertilizer once in early spring and again in the summer. If you want a healthy, attractive, and vigorous bamboo, you should fertilize 2 to 3 times per year. Pruning – To control the spread of your black bamboo, it is recommended to do an annual root pruning. Remove older, unattractive culms and cut off any dead or unattractive branches. Make cuts just above a node, so as not to leave a stub that will die back and look unsightly. Clumping varieties can also be pruned to maintain upright growth or thinned to maintain an airy appearance.